Birla Open Minds Preschool (BOMPS) - Manikonda, under the guidance of Birla Edutech Limited, offers comprehensive solution for education that envelopes the individual's learning period right from the formative early years to K-12 schooling. [March 4th 2019] Holiday for MahaShivratri. [March 15th 2019] Class Photograph. [March 20th 2019] In-House Holi Celebrations. [March 21st 2019] Holiday for Holi. [March 23rd 2019] K2 Graduation Day. [March 23rd 2019] Open House. [March 29th 2019] Class Party. This programme provides a jump start to the parent-child reciprocal relationship and sensorially stimulating activities lead to increased neural connections. In addition, enhanced parenting skills through specialist workshops and the parent support group provide a beautiful impetus to the children's initial learning. This programme has been specially created for the little children in the age group of 2 years to 3 years. The programme focuses on making the process of learning 'joyful' in a safe and secure learning environment. Though we have well planned schedule for this age group, the schedule also provides the teacher complete flexibility to maneuver the session as per the needs of the children in the class and the facilitator 'moves with the child' at his or her pace. Utmost care is taken to ensure that the children are given experiences that take care of the most important age appropriate life skills required. Skills of dressing up, taking care of own self, feeding oneself, understanding own bowel needs and be able to use the wash room, etc are included in day to day routine. Children in the age group of 3 to 4 years are like little masters/ miss who are now ready to explore more every day while being away from their primary care givers. The young learners are given the freedom to explore and engage with the caring support of the facilitators. The sessions are all about 'building with them' the learning process. While getting the young learner to build on their intuitive learning process, care is taken that each learner explores his/ her unique learning style too! The facilitator guides and supports the whole process of this joyful exploration. While catering to the age group of 4 to 5 years, the facilitator is ready to take the young learners to the next level of 'achievement'. The skill sets are by now showing preferences and the need to challenge them becomes imperative. Learning by exploration remains the style where the young learner achieves a sense of fulfillment on completion of a task and this in turn gives him/ her confidence required to move ahead and learn more. 'Excelling at a task' is the focus of the young learner now and for that facilitator works as a motivator. The skills sets by now have evolved and the learner is all set to bring about the finesse into every action. This is best brought out by the repeated practice session ingrained into the curriculum. This is also the stage where the young learner is prepared for formal schooling as the next level and hence given a chance at portraying skills and knowledge on a common platform where the ever important Learning Outcomes of a Preschool are visible. The Learning Outcomes are displayed beautifully through their thought and actions which are only making them 'FUTURE READY'. 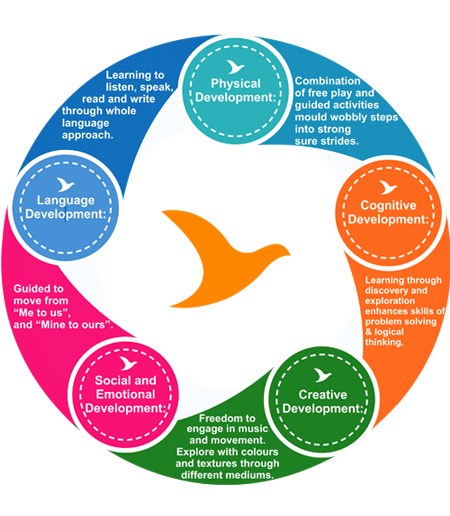 Besides these there are many more that the young learner accumulates and all of these go hand in hand. Copyright © 2018-19 Birla Edutech Ltd. All Rights Reserved.